I’ve started to use TileStream as a node.js server to serve pre-rendered tiles saved in a .mbtiles file. This server can then be used as a tile layer by Leaflet to build a frontend HTML page that will show a map. As I said in a previous blog post, MBTiles is a format created by mapbox that allows to stores millions of tiles in a SQLite database, which can be useful if you want to build an OpenStreetMap solution that will store tiles offline or store it in your own server. There are many alternatives to TileStream, such as TileStache (in python). One benefit of TileStache is that it supports composite layers, which would allow you to serve multiple MBTiles at the same time on the same map. One reason you might want to do that would be if you have a MBTiles file that contains the map tiles of the whole OSM planet with zoom levels from 0 to 10. And then you could have a specific country in another MBTiles file that has the zoom levels 11 to 15. By combining both, you allow a seamless experience where someone could zoom up to 10 on any part of the world and then zoom up to 15 in a specific country. While TileStream does not support this, you could instead decide to merge the two MBTiles file together, to a single file. This single file can then be served by TileStream. This script could also be used if you wanted to update an existing larger MBTiles file, with a newer MBTiles file (that might contain newer tiles for a specific region). After those steps, TileStream was able to serve the single merged MBTiles file across all zoom levels. I was looking for a way to run maperitive, which is a software that allows you to convert OpenStreetMap (OSM) data files in .pbf and .bz2 (that you can find on Geomatrik) to a Mbtiles file format. Mbtiles is a format created by mapbox that allows to stores millions of tiles in a SQLite database, which can be useful if you want to build an OSM solution that will store tiles offline. Maperitive is a .NET application, that should typically works with mono on Linux and on Mac and will work natively on Windows. However, the author does not provide official support for Mac (installations for Linux are here). I didn’t end up using maperitive (it does everything in RAM and does not scale well if you have a big OSM file), but I thought I might give the solution here. I previously wrote this post on the blog of ChooseSocial.PH, an online directory of social enterprises in the Philippines. This is a project I’ve been working on in the last few months and this blog post summarizes the technical choices I have made. When we started building ChooseSocial.PH, we wanted a website that would be reliable and fast while also being affordable. We want ChooseSocial.PH to become the ultimate resource for anyone who wants to learn about social enterprises in the Philippines. We also want it to eventually become profitable, though we admit we’re far from having a sound business model at this point. All things considered, this blog post is about the technical choices and services that we use in order to keep our operating costs to a minimum in the meantime. First of all, we have to recognize that building a website and the applications that power it is rarely cheap. The fact that I have a technical background and that I decided to spent countless hours on the technical implementation myself allowed us to build our platform and website with minimal dollar investment. An NGO or social enterprise without in-house IT talent would need to invest in the initial implementation of their platform. That said, this article is about keeping your website online for cheap after it’s built. There were some initial investments we had to make on the graphic design side. These are the “one time costs” that won’t be needed until your next redesign. We hired someone to create our logo (tip: get Daisy Munoz, she’s amazing), a website theme ($25 on ThemeForest) and stock pictures (65$ on Stocksy, they have great unique shots). While it may be tempting to choose only the free or least expensive themes and stock photos, we would caution against this. Most people or small businesses will be doing the same, and it really wouldn’t be ideal to see elements of your website popping up everywhere. You will always need a domain name and if you want to host and run your own website, you will have to pay for it every year. It can typically be $15 for a .com, but in our case we had to get a .PH domain name for Philippines (+/- $33 on Web.com.ph). This is the part that gets more technical and might change based on your own technology stack. Keep in mind that the technical choices that we have made are for a moderately popular website that could support somewhere in the range of 10 000 to 50 000 visits a month. Some of the services we are listing don’t recommend their free plan to be used in production for commercial usage. However, we have found that their stability and speed were sufficient for our needs. We have both a website and a backend application (which we use to input the information and research that we conduct on each social enterprise featured on our website) that are running on a single Node.js application. We use the Heroku free plan to host the application. 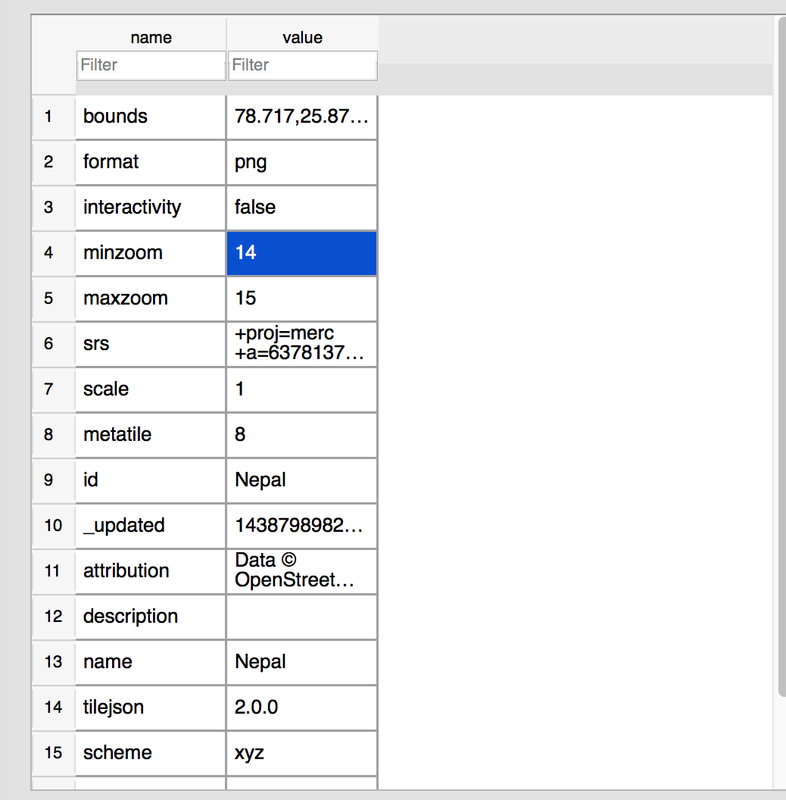 For our MongoDB database, we use the sandbox plan on mongolab, which offers 500Mb for free. We have a cron job setup for free locally to backup our database daily. The search engine powering our internal search is Azure Search and free as well when using less than 10 000 records. In order to let people email us with the Contact Us box on our website, we use SendGrid which allows 400 emails a day for free. People can also sign up for our newsletter using MailChimp, which supports up to 2000 free subscribers. In order to have an email associated with our domain name (info@choosesocial.ph) we use Zoho Mail that lets you to create 10 free email addresses with the Lite plan. We built a map on our Explore page that lets people explore social enterprises based on their location in the Philippines. For various reasons we wanted to avoid Google Maps so the map is using the community and open-based OpenStreetMap. In order to render the map on a page, you need a server that will provide you with the tiles. You can get free tiles with MapQuest, which is what we used for a while. However, we weren’t very satisfied with the visual quality of those maps (colors are not great and the resolution is poor) so we switched to Mapbox. Their free plan is 50,000 views a month, which goes a long way. If you need more, you can get a discount on their paid plan if you mention to them that you are a non-profit. To ensure the stability of our website, we have various tools that help us monitor the performance and alert us of eventual problems. We use the free plan at UptimeRobot to monitor the website and email us if it goes down. We use the NewRelic stark free plan with Heroku to analyze and measure the speed of the website. And finally we use the Heroku free test plan at Raygun to email us if a user encounters an application error while browsing the site. All of these services have allowed us to successfully launch ChooseSocial.PH and accomplish the technical goals we had set: reliability, speed and affordability. Feel free to contribute in the comments if you have found other useful and affordable services that could be useful for those in the NGO, social enterprise, and start up community! 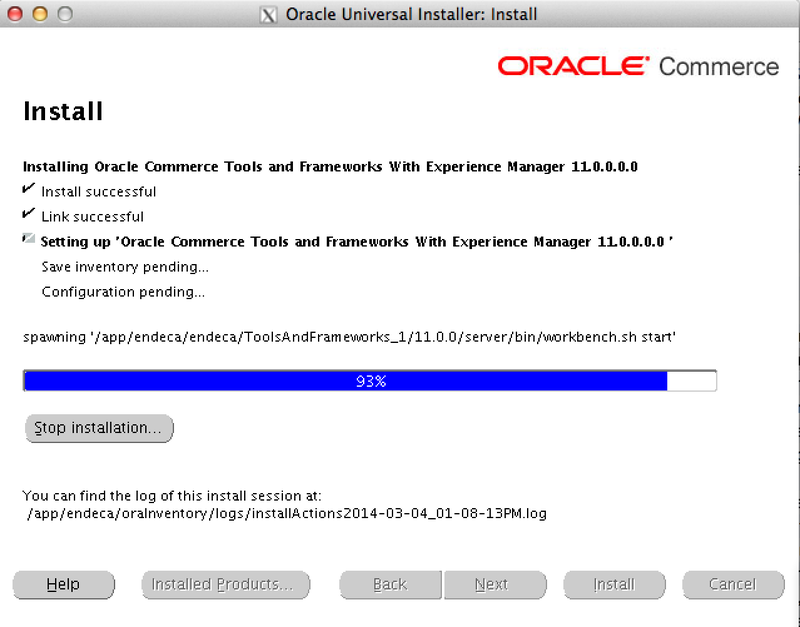 If you are trying to install Tools and Frameworks under the new Oracle Endeca Commerce v11 with Linux, you might have noticed that the installer just got more complicated. We used to be able to install Tools and Frameworks by moving an unzipped directory to the right location and that would be all. The installer is trying to run the program through a visual user interface that is using a X window, which isn’t possible through a text-based terminal. From there, you can use the silentInstaller (see documentation for more details) but there are less options available and I personally had issues running it. So instead, here are the steps if you want to run the installer with X11 to be able to interact with the user interface. If you are on Mac, download and install Xquartz, which is an open-source X.Org X Window System (if running OS X before 10.8, it is bundled with the OS). For other operating systems, you will have to find your own version of X.Org X11 and install it. The installer will automatically launch XQuartz (or your own version of X.org on your operating system) on your machine and you’ll be able to install Endeca Tools and Frameworks on the Linux box. I was having lots of difficulties to install node.js / npm on a server running CentOS 5. The node.js documentation mentions that we should be adding the EPEL repository and then using “yum install npm” to install it. However, no matter how much I tried, this package seems unavailable on CentOS 5. Compiling from source was a solution but I really did not want to install all the development tools on that machine that is essentially just a testing server. All I needed node.js for was to run tests from the mocha test framework. After much research I finally found an answer on serverfault (a branch of StackOverflow). It suggests to use nave, a virtual environment for node that will install npm and node.js just for the local user. Turns out this is exactly what I wanted since it would simplify the migration if I need to move my testing environment to another server. And that’s all! node and npm are available from this specific user, no need to compile node from source to use it from CentOS. Oracle Endeca Information Discovery is shipping with the ETL tool “Endeca Information Discovery Integrator”. This is in fact a white label name for the open-source tool CloverETL with some added features. Since Clover can work on Mac, I was wondering if I would be able to make CloverETL work on Mac and be compatible with the existing Endeca tools. Most of the time during Endeca development, we use Endeca Integrator Server to load the data into Endeca Server. Those software typically run on powerful servers so the only tool you really need to use locally is Integrator, to be able to make modifications to the Endeca loading graphs and upload them onto Endeca Integrator Server. Since I use a Mac for all my development needs, it only makes sense to run Integrator locally on Mac and let the other tools run on the servers. Those instructions are for Endeca OEID 2.3, assuming someone already installed it on Windows. I believe the instructions are very similar for Endeca OEID 3.0 and also on Linux (using different paths). Since you already own a license of Clover by buying OEID, I assume that this is safe to transfer your license from the Windows version of Clover to the Mac version, but do it at your own risk! When you launch CloverETL Designer on Mac, copy paste the content of the license.dat file into the box that asks you to enter your license file. That is all! You now have CloverETL with all the extra Endeca graph components and also with the ability to export and run your graphs on Integrator Server. You can start editing your graphs in your existing Endeca project. With Oracle Endeca Commerce, the Workbench application is storing all its configuration files inside a configuration repository. That includes typical workbench configurations used by the MDEX, Experience Manager configurations such as cartridges XMLs, landing pages and also media assets accessible by the Media Banner cartridge. While Endeca provides scripts in the control project folder to upload content to that configuration repository, such as set_media, set_editors_config, set_templates and import_site, one less known fact is that you can connect to the repository through a WebDav client and have a direct access to all the files and folders. The reason it’s possible is because the technology underneath the Endeca Configuration Repository is Apache Sling, a REST web framework built on top of the Java Content Repository Apache JackRabbit. If you use Windows, you can download a client such as CloudSafe to connect to it. On Mac, Cyberduck supports it (in theory MacOS X is supposed to support the WebDav protocol natively but for some reason when trying to connect to this WebDav repository, I can’t establish the connection). Once you are ready to connect to the WebDav server, the URL to use is the link stored in the config file WorkbenchConfig.xml for the IFCR component. If the URL is: http://localhost:8006/ifcr, you should add /sites/name_of_your_project at the end. So for the reference application, it would be http://localhost:8006/ifcr/sites/Discover . The user/password is be the same as the one stored in that same config section (admin/admin by default). Once you are logged in with WebDav, you can start transferring files back and forth between the config repository and your own hard drive. I wouldn’t advise to change the XML config files stored in that config repository without knowing exactly what you are doing but there is a clear use case for managing your media assets (such as pictures and videos) that are accessible through the Media banner cartridge in Page Manager. While Endeca provides the set_media control script to upload files, being able to drag and drop files and delete them as you want directly into the config repository is much more easier and natural to do with a user interface than having to re-run that control script every time you want to make changes to your media files. You might as well consider giving access to that repository to your business users so that they can easily start managing the media files that they will need to use when creating the landing pages. Let me know in the comments if you can think of other interesting use case to use the Endeca Configuration Repository through a WebDav client! In the last few months, I’ve followed an online class called “Introduction to Infographics and Data Visualization” by Alberto Cairo (Twitter: @acairo) at the Knight Center for Journalism in the Americas. It was the second edition of the course and I would recommend you to join a future edition if you are interested in the topic. It was mostly targeted for journalists, so there was a lot of content about infographics and lots of examples are visualizations we see in magazines. However, lots of those concepts can still be applied in IT world and there was some good reading provided about designing dashboards. There are lots of examples to explain why some types of data visualization (pie charts, bubble chart on a map) rarely make any sense for the readers. In any way, it was a great introduction to the topic of data visualization. I wasn’t new to the topic because of my experience with Endeca dashboards and Salesforce dashboards but it’s great to leave the technical aspect of those visualizations and focus on what data visualization can actually mean for to the users. The class didn’t provide training on technical tools, it was really more about learning about the theory behind the topic. The class provided a trial license for Tableau, which is a nice touch, but I haven’t spent time learning on that. I was initially planning to do all the homeworks related to the course and apply for an official course certificate at the end of the class. However, I quickly fell behind on the weekly schedule they were proposing and did not have enough time to do all that. So I really only focused on learning on the topic based on the content they provide (youtube videos + PDF reading) and did not do any homework. It really reminded me how I do not miss university! Quick post to link to an excellent tutorial on the Heroku website to use MongoDB as a database with Node.Js using the Mongoose library. This is the exact same implementation that we used to build ThreatWiki with Mongoose. Quick and fast to implement. One thing that surprised me about this guide is that it recommends to specify the option “safe” mode for the connection with mongoDB. The safe mode is the mode that guarantees that you will be informed by an error if a write to the database fails (in the default implementation of MongoDB it’s off by default to increase speed). By default this is set to true for all schemas which guarentees that any error that occurs will get reported back to our method callback. So the safe mode is already enabled by default by mongoose for every save on the database, so it doesn’t seem necessary to specify it like the tutorial is proposing.